This article reviews clinical signs of CGS, current treatment modalities, and promising treatment options that may be available soon. The mucogingival (MG) line provides a landmark at which the clinician differentiates disease entities. 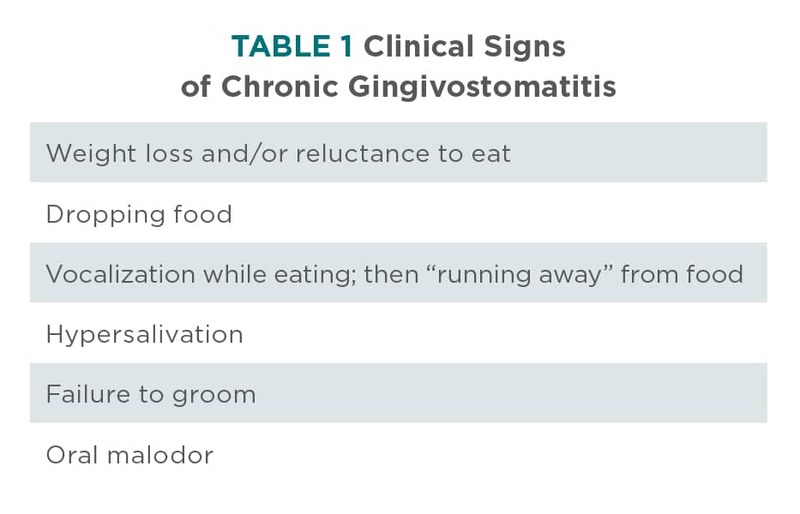 Routine gingivitis does not extend beyond the gingiva, while stomatitis always extends beyond the MG line. When stomatitis extends into the alveolar and buccal mucosa, it is defined as alveolar or rostral stomatitis. Figure 1. Gingivitis; note that inflammation is relegated to the gingival margin only. Figure 2. Chronic gingivostomatitis of the right maxilla. This disease process of CGS is a result of an inappropriate immune response to oral antigenic stimulation and, unfortunately, there may be one or more initiating causes that trigger this event. Dental plaque bacteria, even in very small amounts, have been shown to stimulate the immune system. At one time, it was thought that, in addition to plaque bacteria, this clinical phenomenon might have contributing factors, such as an infectious agent (ie, feline calicivirus [FCV], feline leukemia virus [FeLV], feline herpesvirus, feline immunodeficiency virus [FIV], and Bartonella henselae). 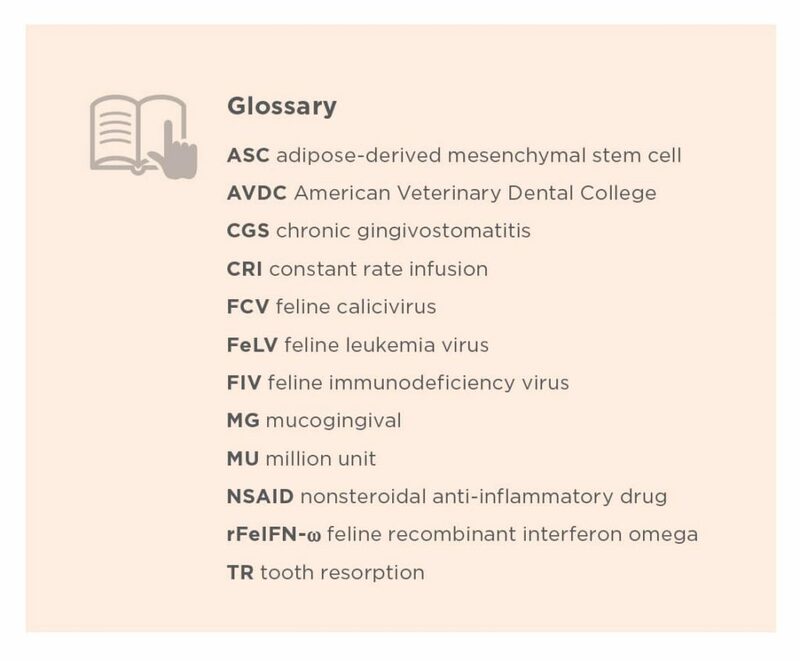 While it is clinically important to know the immunologic status (ie, FeLV or FIV positive/negative) of the patient at the time of the examination, these disease processes may not necessarily be causative agents, but can contribute to the morbidity of the patient in the healing phase of treatment. 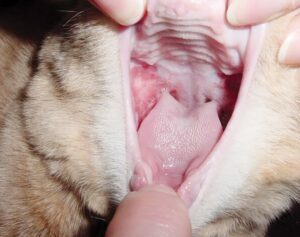 Clinical signs of CGS can be quite variable among cats (Table 1), but most experience moderate to severe oral pain and, in severe cases, cats may cry when their mouths are opened. Inflammation of the alveolar and buccal mucosa of premolars and molars (most often symmetrical) and caudal oropharynx (Figure 3). In some patients, hyperglobulinemia is present.2 However, neutrophilia is not a hematologic finding in cats with CGS. Figure 3. Caudal mucositis associated with chronic gingivostomatitis. Successful treatment of CGS requires the minimization of oral bacteria.1 The most favorable clinical control for resolution of oral inflammation is via partial or full mouth complete tooth extractions (Figures 4–6). In addition to complete tooth extraction, the marginal bone should receive alveoplasty (smoothing bone and alveolus to remove ridges and spicules). 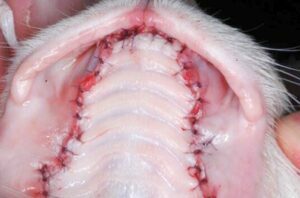 Only American Veterinary Dental College (AVDC) specialists or veterinarians with extensive experience in feline extraction should consider approaching these cases surgically. Figure 4. 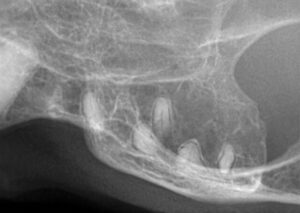 Postoperative image of mandible after full mouth extractions in a 3-year-old cat. Figure 5. Postoperative radiograph confirming complete tooth extraction in Figure 4 cat. Figure 6. Clinical resolution of chronic gingivostomatitis in a 3-year-old cat. Periodic periodontal therapy that includes scaling, polishing, and probing results in minimal success due to the fact that dental plaque bacteria repopulate and initiate the inflammatory cascade soon after therapy. Home care is usually unrewarding as cats are resistant to daily or twice-daily tooth brushing and oral rinses. 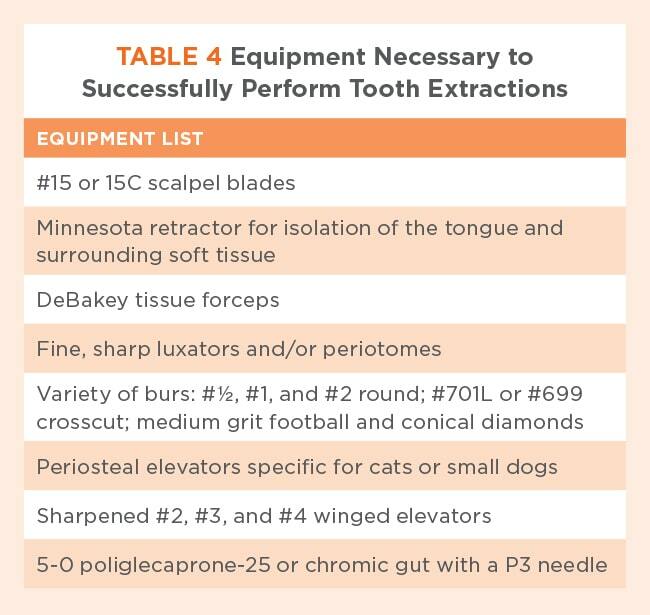 With extractions, emphasis is placed on the absolute need that all root structures must be removed, as any tooth root remnant will not allow for resolution or improvement of clinical signs (Figure 7). It is my opinion and that of other AVDC specialists that extractions should only be completed with the aid of dental radiography to confirm complete tooth root extraction. Figure 7. Tooth root remnants in patient with refractory CGS. This cat did not respond favorably to therapy due to incomplete tooth extractions. Histopathology of inflamed mucosa and gingiva reveal plasma cells with varying numbers of lymphocytes, neutrophils, and macrophages. Mast cells may be seen in higher numbers, but they can also be seen in cases of periodontitis and tooth resorption.4 Rarely is histopathology warranted, unless unilateral lesions are seen. Histopathologic differentiation between CGS and neoplasia is needed for those particular cases. 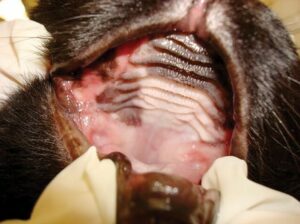 Read A Review of Feline Oral Squamous Cell Carcinoma in the November/December 2016 issue of Today’s Veterinary Practice, available at tvpjournal.com. For those cats that eat hard food as their sole diet, a transition to canned food is needed prior to surgery. This canned diet should continue for all cats at least 2 to 3 weeks postoperatively. An appetite stimulant (eg, mirtazapine, 3.75 mg/cat PO Q 72 H) may help cats adjust to the new texture and diet and can be continued through the posttreatment phase. Pain management is recommended, not only in the pre- and postoperative phases, but also the intraoperative phase (Table 2). Buprenorphine provides pre- and postoperative analgesia for these patients. Compounded gabapentin has shown benefit in severely painful cats. Usage of an approved nonsteroidal anti-inflammatory (NSAID) in the postoperative phase of therapy compliments analgesic therapy. The author defines refractory as no improvement 60 days post full mouth extraction. As mentioned earlier, approximately 10% of CGS surgical cases are refractory, and these pose a very difficult therapeutic challenge to the clinician. Following are the most current treatment modalities available, with a peek at one of the most promising options for refractory CGS. This double-blind study evaluated 16 cats administered a microemulsified cyclosporine suspension (Neoral, novartis.com).1 The cyclosporine product was compounded at 2.5 mg/kg per 1 mL in a cod liver oil base, with tuna flavoring, and it was administered at 1 mL PO Q 12 H.
More recently, a once-daily modified cyclosporine (Atopica, us.atopica.com) is now available for cats (Table 3). The dosage for that product is 7.5 to 10 mg/kg Q 24 H, as it needs to be given at higher dosages than microemulsified cyclosporine to achieve adequate blood levels. Establishing trough whole blood cyclosporine levels (attained 12 H after the last dosage given) > 300 ng/mL demonstrated the most significant clinical improvement (72%).1 Trough whole blood cyclosporine levels should be tested monthly if there is no clinical improvement. The goal of > 300 ng/mL should be attained and, if values are lower, treatment dosage is increased accordingly. Proper equipment (Table 4) and knowledge of mucogingival flap presentation are essential to attain maximum clinical success. A variety of burs and diamonds are needed to facilitate extraction and alveoplasty. Instruments, such as a Minnesota retractor and DeBakey tissue forceps, can help prevent tissue maceration during the procedure. Fine luxators or periotomes help fatigue the periodontal ligament without damaging the surrounding alveolar bone. Magnification and illumination are essential for this procedure, or any oral surgery. While this article does not address the step-by-step procedure to perform quadrant extractions, it is prudent to review current literature or even take one or multiple laboratories to attain clinical competency. The study hypothesized that ASC therapy would result in systemic immune modulation, inflammatory lesion reduction, and clinical sign improvement, either by complete cure or substantial reduction in inflammatory lesions; this hypothesis was confirmed by clinical, histopathologic, and immunologic testing. Each cat was hospitalized posttransfusion for 2 to 3 days to monitor for possible adverse reactions. The researchers also established that cats with < 15% CD8 cytotoxic T cells (with low expression of those cells) were 100% responsive to ASC therapy, while cats with > 15% CD8 cytotoxic T cells responded poorly.2 This biomarker may assist clinicians in predicting clinical response to ASC therapy. Once the ability to preselect favorable clinical cases is standardized and proper culture expansion and characterization are made commercially available, this favorable treatment for CGS provides an excellent opportunity for substantial or total clinical resolution of previously nonresponsive cats. Learn more about adipose-derived mesenchymal stem cell therapy by reading Regenerative Medicine for Soft Tissue Injury & Osteoarthritis in the July/August 2016 issue of Today’s Veterinary Practice, available at tvpjournal.com. CGS is a complex syndrome for which a true cause-and-effect has yet to be established. Until that time, partial or full mouth extractions are the gold standard of therapy. Complete tooth removal—with absolutely no tooth root remnants remaining—is essential for progression to clinical improvement. Utilization of dental radiography is not an option but rather an essential diagnostic and confirmational tool to ensure complete removal of the entire tooth. Confident knowledge of surgical flaps and quadrant extractions is highly recommended prior to undertaking this oral surgery. 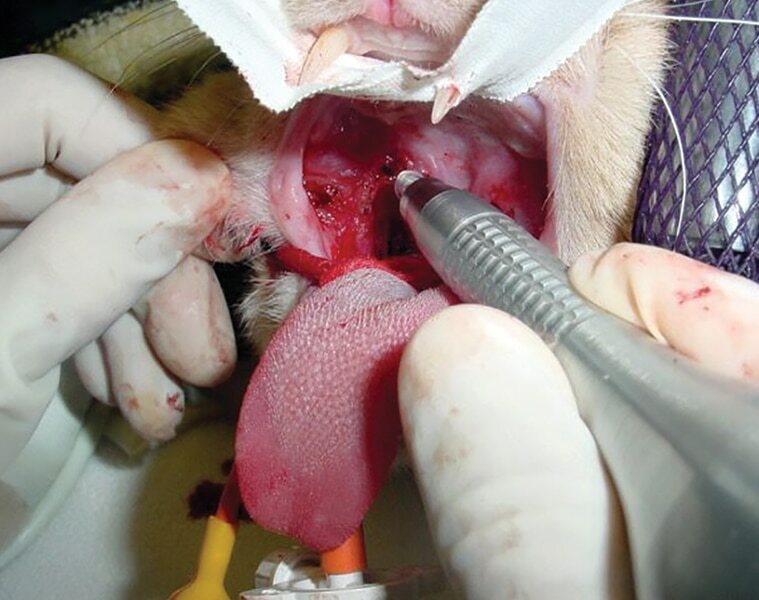 The veterinarian should have the appropriate armamentarium available to perform quadrant extractions in the cat, but the best tool for the clinician is patience. Use of systemic antibiotics in lieu of partial or full mouth extractions is ill-advised, and only contributes to possible antibiotic resistance in patients. At the immediate intra- and postoperative phases of treatment, antibiotics may aid in soft tissue healing; however, chronic, long-term use of antibiotics has not been documented to be effective. Transitioning the patient to canned food (with an appetite stimulant, if needed) prior to surgery, minimizing chronic oral pain with opioid therapy (eg, buprenorphine) and gabapentin, and removing all tooth structures provide the practitioner the best chance of clinical success. Addressing the immediate postoperative phase is critical. Utilizing buprenorphine in the regional nerve blocks provides prolonged analgesia. Additionally, an opioid and ketamine loading dose followed by a constant rate infusion (CRI) or a fentanyl CRI immediately prior to and following anesthesia can augment the opioid administered in the regional block. Finally, refractory CGS cases should be treated with corticosteroids, cyclosporine, feline recombinant interferon omega, or CO2 laser. With ASC therapy available in the future, clinicians will have another option for treating refractory cases of CGS. Lommer MJ. Efficacy of cyclosporine for chronic, refractory stomatitis in cats: a randomized, placebo-controlled, double-blinded clinical study. J Vet Dent 2013; 30(1):8-17. Arzi B, Mills-Ko E, Verstraete FJ, et al. Therapeutic efficacy of fresh, autologous mesenchymal stem cells for severe refractory gingivostomatitis in cats. Stem Cells Transl Med 2016; 5(1):75-86. AVDC accepted nomenclature, available at avdc.org. Lommer MJ. Oral inflammation in small animals. Vet Clin North Am Small Anim Pract 2013; 43(3):558-571. Belgard S, Truyen U, Thibault JC, et al. Relevance of feline calicivirus, feline immunodeficiency virus, feline leukemia virus, feline herpesvirus and Bartonella henselae in cats with chronic gingivostomatitis. Berl Munch Tierarztl Wochenschr 2010; 123(9-10):369-376. Dowers KL, Hawley JR, Brewer MM, et al. 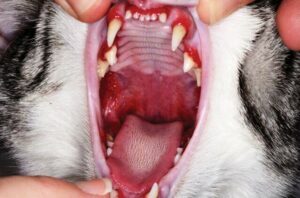 Association of Bartonella species, feline calicivirus, and feline herpesvirus 1 infection with gingivostomatitis in cats. J Feline Med Surg 2010; 12(4):314-321. Jennings MW, Lewis JR, Soltero-Rivera MM, et al. 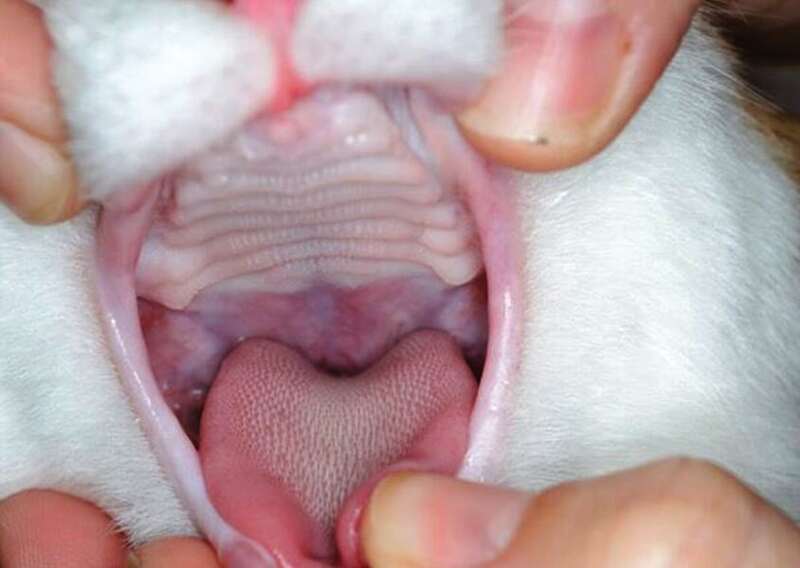 Effect of tooth extraction on stomatitis in cats: 95 cases (2000-2013). JAVMA 2015; 246(6):654-660. 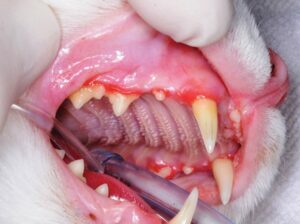 Hennet P. Feline chronic gingivostomatitis: Extraction and what else? Veterinary Dental Forum, 2010. 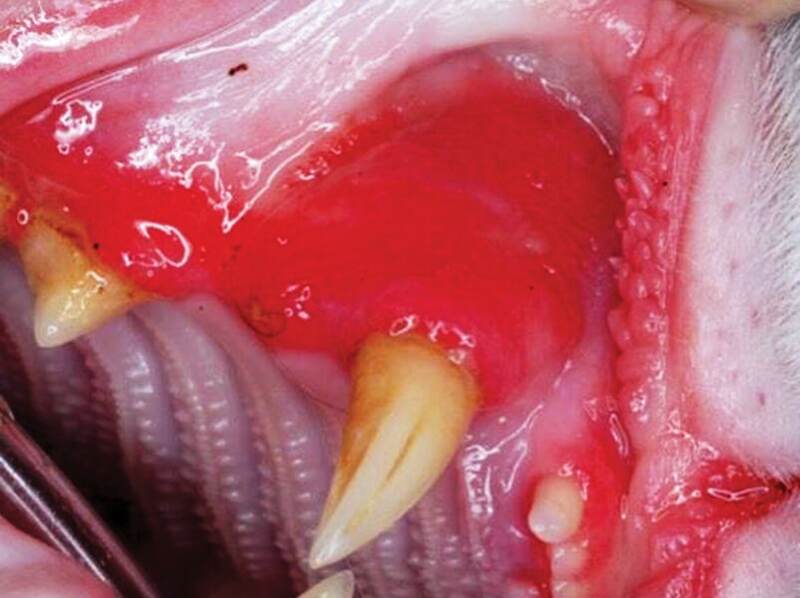 Hennet P. Chronic gingiva-stomatitis in cats: Long-term follow-up of 30 cases treated by dental extractions. J Vet Dent 1997; 14(1):15-21. Beckman B. 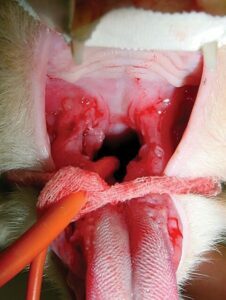 Regional nerve blocks for oral surgery in companion animals. Compend Cont Ed Pract Vet 2002; 24(6):439-444. Modi M, Rastogi S, Kumar A. Buprenorphine with bupivacaine for intraoral nerve blocks to provide postoperative analgesia in outpatients after minor oral surgery. J Oral Maxillofac Surg 2009; 67(12):2571-2576. Snyder C. Do locally administered opioids with local anesthesia increase anesthetic duration? Veterinary Dental Forum, 2015. Davis EM. How I treat refractory feline chronic gingivostomatitis. Clin Brief 2015; Jan:19-22. Hennet PR, Camy GA, McGahie DM, Albouy MV. Comparative efficacy of a recombinant feline interferon omega in refractory cases of calicivirus-positive cats with caudal stomatitis: A randomised, multi-centre, controlled, double-blind study in 39 cats. J Feline Med Surg 2011; 13(8):577-587. Lewis JR, Tsugawa AJ, Reiter AM. Use of CO2 laser as an adjunct treatment for caudal stomatitis in a cat. J Vet Dent 2007; 24(4):240-249. Barden Greenfield, DVM, DAVDC, FAVD, practices in Memphis (Memphis Veterinary Specialists) and Little Rock (Arkansas Veterinary Specialists). He is also the founder of the Mississippi Valley Veterinary Dental Educational Center (MVVDEC) in Memphis, providing dental CE to veterinarians and technicians in the central U.S. Dr. Greenfield is the president of the AVDC and has been serving on the AVDC board for the past 4 years. In addition to his clinical practice, Dr. Greenfield enjoys lecturing at the local, state, national, and international levels. He has authored multiple articles for the Journal of Veterinary Dentistry. Dr. Greenfield received his DVM from Mississippi State University. He may be reached at drg@yourpetdentist.com. 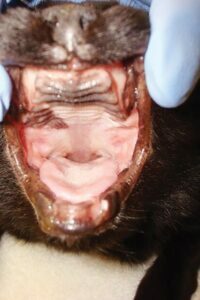 This article provides an overview of current and future therapeutic options for management of cats with chronic gingivostomatitis (CGS) and refractory CGS. After reading this article, participants will be able to recognize the signs of chronic CGS in cats and compare treatment options for CGS and refractory CGS. Which of the following is TRUE with regard to the use of cyclosporine therapy in refractory CGS? a. Minimum whole blood cyclosporine trough values of 100 ng/dL are recommended for favorable treatment outcome. b. Modified cyclosporine has better oral absorption than the microemulsified version of cyclosporine. c. Patients receiving prior corticosteroid therapy respond better to cyclosporine therapy than those that have not received prior corticosteroids. d. The mechanism of action of cyclosporine is to minimize IL-2 expression, which subsequently minimizes T cell numbers. CGS in cats affects approximately how much of the general cat population? Which of the following is FALSE with regard to clinical and hematologic signs of CGS? a. The mucogingival line provides a landmark by which the clinician differentiates disease entities of gingivitis and stomatitis. b. 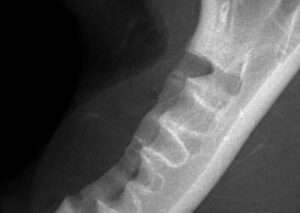 When inflammation occurs in the caudal oropharynx lateral to the palatoglossal folds, it is identified as faucitis. c. Oral submucosal tissues are often involved in chronic gingivostomatitis cases. d. Hyperglobulinemia is a common finding in these cases. Which of the following has been implicated in active shedding during clinical cases of CGS? Which of the following is FALSE with regard to perioperative pain management in a CGS case? a. Buprenorphine may be added to regional nerve blocks to enhance analgesia for up to 3 days. b. Robenacoxib may be used with corticosteroids to provide a balanced analgesic response. c. Gabapentin has shown benefit in severely painful cats. Which of the following is FALSE with regard to treatment options for CGS? a. Antibiotics should not be used regularly to control the bacterial plaque formation in CGS patients. b. Partial mouth extractions parallel full mouth extractions with resolution of clinical signs, provided the canines and incisors are not involved. c. CO2 laser therapy is a viable treatment option to char caudal mucositis lesions prior to extraction of teeth. d. Pre- and postoperative dental radiography must accompany all extractions in CGS patients. Which is TRUE with regard to adipose-derived mesenchymal stem cell (ASC) therapy and a recent study using this methodology? a. Commercially available adipose-derived stem cells provide an excellent alternative to other conventional treatments for refractory CGS cases. b. Cats with > 15% CD8 cytotoxic T cells with low expression of those cells were 100% responsive to ASC therapy. c. ASC therapy provides an excellent outpatient method for treatment of refractory CGS. d. Mesenchymal stem cells have been associated with regenerative ability due in part to their ability to modulate both innate and adaptive immune responses. Which of the following is FALSE with regard to CGS? a. Tooth resorptions may occur simultaneously with CGS. b. Food allergies can be a contributing component to CGS. c. Calculus formation contributes to the exacerbation of clinical signs of CGS. Which of the following is TRUE with regard to the use of corticosteroids for the treatment of refractory CGS cases? a. When using this class of drugs, it is recommended to use the immunosuppressive dosage. b. Corticosteroids enhance cyclosporine therapy, but at a low clinical dosage of 1 mg/kg PO Q 48 H.
c. Corticosteroids are contraindicated when using CO2 laser therapy. d. Thirteen out of 16 cats in a recent study responded favorably in treatment of CGS. What is the percentage of refractory CGS cases after full mouth extractions?